Discussion in 'The Competitive Edge' started by _Simon_, Apr 8, 2018. Decided on short notice to enter a tournament in three weeks time on the 29th. 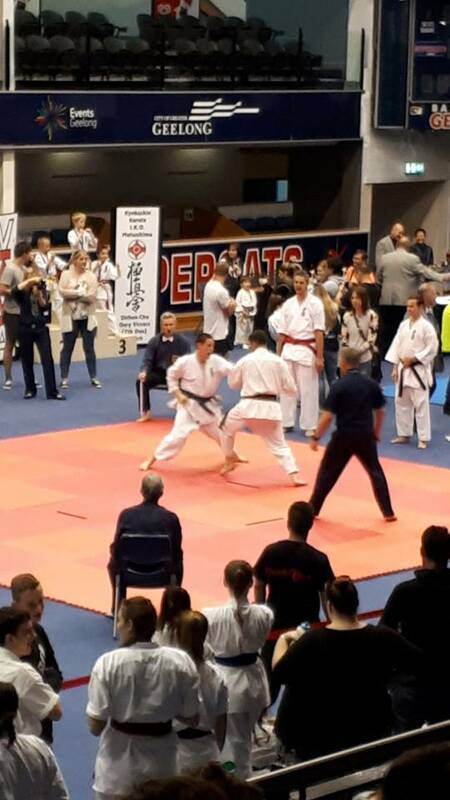 It's the State championships Kyokushin tournament, they have the noncontact in the morning and the full contact/knockdown in the afternoon. I'll be competing in the noncontact (light contact to body), and not sure yet what divisions there are. It's continuous sparring format (2 minute rounds) which I've never competed in before so should be interesting and a great experience. I definitely prefer point sparring and love that style of competition, but I figure this tournament will help a bit in preparing for the other ones I want to enter later in the year. Three weeks only to prep haha, but I'm not gonna take it too seriously. I'll up my training a little bit and do what I can, but definitely going to be a very relaxed preparation. P.S. I'll post my other tournaments I enter here too just for funsies. Good luck just enjoy it. There's no pressure in these things because you're not likely to be hurt and if you lose so what you're not getting paid so who cares. Competition often crosses my mind. There is definitely something about competition that causes a guy to want to push it just a little bit harder. Not since high school wrestling have I been involved in competitive sports. But I like to compete against myself. And perhaps I will find a bit of competition right here in this forum. I have a big network engineering test coming up on 4/24 for my job. I also am in a very relaxed preparation mode. I am using Cisco Spark live chat application to study with other serious candidates online. I think bantering about with other serious students does add a bit of a competitive aspect. But just as here, there are individuals there from all levels of readiness and weight class. Many are much farther ahead of me in that game, and I suppose many are behind me in the quest for that diamond. But it's fun to chat with others who are working on the same goal. It is the highest and most respected certification in the telecommunications industry. Cisco CCIE. A great challenge. Also I have lost 130 lbs over the last year. I am watching Kung Fu videos and doing a push ups, kicking, squats, treadmill, weights workout routine 3 times per week. I like the Kung Fu philosophy and have been a Kung Fu television program fan since I was a kid. Now 55 years old. 6' 4" 170 lbs. Was 286. Went down to 158 using fasting program. So I can eat good for a couple of weeks. Now working back down again so I can eat good for another couple of weeks. I always eat good, it's just a matter of how many calories I allow myself to consume. Thanks to everybody for being here and I'm hoping to learn much and kick up my training game a notch or two in the process. Let's go get 'em guys! Go gettum', Simon. Have some fun, bro. Welcome to MartialTalk, Doug. Hope you like it here, we have fun. Sweet. Good luck my fellow. Thanks heaps guys, appreciate it muchly and am looking forward to it. Am helping out tonight with some tournament prep for some of the juniors from my old dojo who are entering too, will be great training back in the dojo (usually help out in the kids karate on Wednesdays, but this'll be fun too). I think most of my home training will be just simulating the 2 minute rounds, combo work, footwork err.. work, and a bit of extra cardio on other days. Will scale back weights to 2 days a week and just a generic all-round routine there with no overdoing it and no crazy intense stuff (steering well clear of failure too). thank you Simon! glad to be here! Prep is going well, and really it's just been to get myself into the swing of things, no elite training schedules, as I'm really just entering this one for fun and experience. Just struggling with some pain stuff as usual, so it's been up and down... but am doing well at the moment. I went to that class with my old dojo, and did really well, apart from the last exercise which I had a bit of a pelvic pain flareup so had to sit out, but very proud that I got through most the class considering it's been awhile. Also did some sparring with the juniors and myself to prepare us, and also a bit of sparring in the kid's class last Wednesday. Tonight I did some home training, and did 10x 2min rounds of shadowsparring with 1min rest in between, just to try and replicate if that were to occur (which it probably won't in the tournament, but if it did I'm ready ). You're sparring with kids to prepare to compete....not the best strategy unless you plan to lie about your age to enter the junior categories. Ah but I SMASHED em!! That's great bro, but I have a question to you, what's up with the Oyama thing? The training day you talked about, just remembered it lol. Hey mate, was actually going to post about that haha, yeah I didn't end up going. Have been really up and down healthwise, so thought best to sit out so that I could rest up for the tournament, sorry bud . But yes, tournament day today, big breath in and out... see how we go! Yeah went really well thanks! 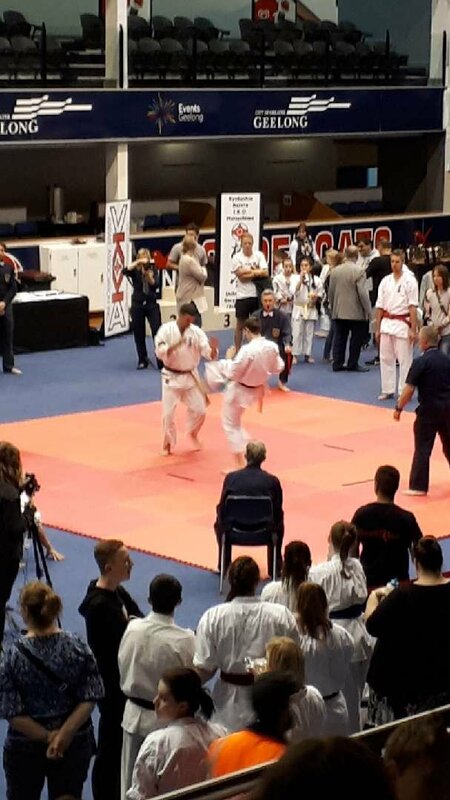 There were only seven people in our division (male open division), my match was against a 1st kyu. Unfortunately I lost in the first round but apparently it was really close. I honestly thought I had won it for sure, but I'm really stoked with how I did. I moved really well and footwork felt great, got alot of shots in and felt on top of my defense. But got three flags against and one for me. Even my old instructor came up to me afterwards and said he was confused about that decision as he thought I absolutely had it too haha. Bit disappointed I didn't make it to the second round, but honestly I'm really happy with how I performed. And considering just how hellish it's been recovering and getting back to a normal basic functioning level, the fact I could go out and do that really was a massive deal. Hehe true, it does definitely happen, but I knew each and every one of the corner judges and also the head judge, and knew they didn't have any association to the fellow was sparring. But yeah, I know that there will always be decisions that aren't always agreed with. And they did see it objectively whereas I saw a whirlwind of stuff hehe. Just felt like I was blocking/evading alot of his stuff, but stoked nevertheless. You got a video of it? Nah I didn't have it taped it but there was a live streaming on youtube actually... Ah just scrolled through it (there's something like 9 hours worth haha) and I found it! Mine is at 1h11m. I'm the green belt (the red tag side). Now watching it back it did look like he attacked more, just didn't seem that a great deal of them got through, as I felt I was really working on my footwork, angles and evading. And I was moving back a bit but it was on purpose, perhaps they saw him as more 'dominating' as he pushed me back more? And I certainly could have done better with power in some punches for sure. All in all I'm happy with it considering the condition I'm still in.